Heze Spring Nursery participated in the 7th Hortiflorexpo China, the largest official trade show in Chinese horticulture, floriculture and garden field and which was held from Apr. 6-9, 2005 in Intex Shanghai. The show was organized by China Flower Association.Our booth number: F121. Welcome to visit our booth. Prof.Ken Tilt and his team in Auburn University in Alabama, USA are carrying out a research program testing which lactiflora cultivars can do well in in the Southern United States, they want to find the proper way to grow peonies in the Southern United States. Heze Spring Nursery supplied 10 cultivars to this program free of costs in November 2005. Yew Dell Gardens ( www.yewdellgardens.org ) and Midwest Peony Society in Indiana are working to set up a world class tree peony garden for all the world visitors to see and admire. The garden will have over 750 tree peonies in the display along with beautiful hardscaping and complimentary plantings of trees and shrubs or oriental style.The garden will have the mostimpressive collection and display of tree peonies in the US.Each plant have a label with name and description of per variety. The garden will be open from 2006 spring. Heze Spring Nursery has the pleasure to donate 50 bare root tree peony to help Yew Dell Gardens carry out this project in November 2005.These tree peony have been planted in the garden, they will bloom in Spring of 2006! Heze Spring Nursery will participate the 8th Hortiflorexpo China which will be held at the Beijing Exhibition Center ( Address: 135 Xi Zhi Men Wai Street, Beijing, China 100044 ) on April 11-14th, 2006.Our booth number is No.2004 in No.2 Hall ( click here to see booth map ). Welcome to visit our booth. From December 1, 2007, only licensed growers or exporters in China can export tree peony, herbaceous peony and other plant material to foreign countries. Heze Spring Nursery is one of the earliest companies in Shandong Province who get the license, license number is 3714ZM002. Heze Spring Nursery will participate the IPM 2008 in Essen, Germany on January 24-27 2008. 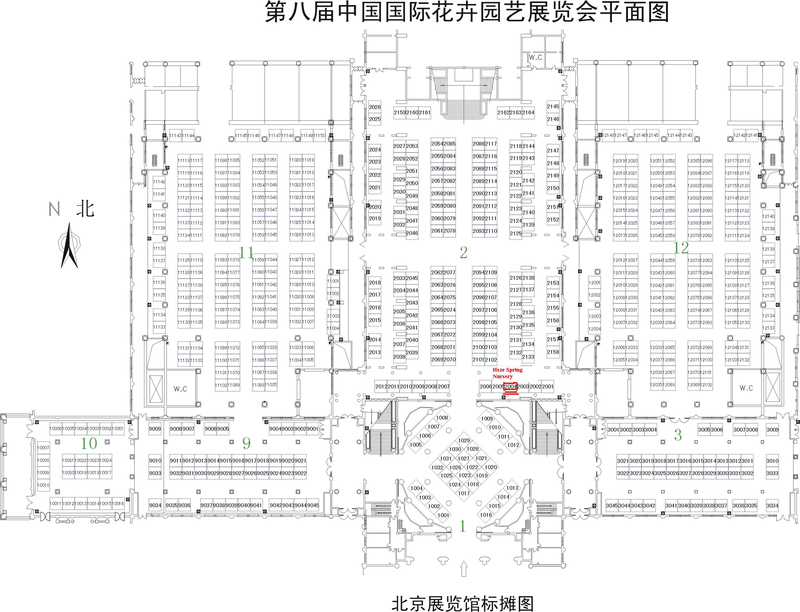 Booth number is 430, in Hall 2. Welcome to visit our booth. Click here to see hall map. Two peony growers from Holland visited us on June 18 and June 19. Three Hungary companies visited us on July 15, they have interests to import Chinese tree peony into their country. We will attend the 2012 Plantarium in Boskoop Holland from August 22 to August 25 , our stand number is 251, welcome to visit our stand.